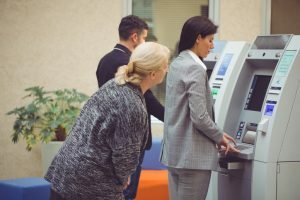 Automated teller machines make banking very convenient. With the touch of a few buttons, you can withdraw cash, make deposits and transfer funds all over the world. While ATMs are helpful, it just makes sense to exercise caution when using one. Survey your surroundings before conducting a transaction. Beware of anything or anyone that looks suspicious. Only use well-lit, unobstructed ATMs. Look for possible fraudulent devices known as skimmers attached to an ATM. If the ATM appears to have any attachments or alterations to the card slot or keypad, do not use the terminal. Only enter your PIN once for a transaction. If you are prompted more than once, there could be something suspicious going on. Thieves who engage in ATM skimming use hidden electronics to steal the personal information stored on your card and record your PIN number. A skimmer is a card reader that is placed over the ATM’s real card slot. When you slide your card into the ATM, you’re unwittingly sliding it through the counterfeit reader, which scans and stores all the information on the magnetic strip. Then, to get your PIN number, the thieves use tiny spy cameras hidden in small objects placed near the number pad to record your entry. Some ATM skimming schemes employ fake keypads in lieu of cameras to capture PIN numbers. Just like the card skimmers fit over the ATM’s true card slot, skimming keypads are designed to mimic the keypad’s design and fit over it like a glove. If you notice that the keypad on your ATM seems to protrude oddly from the surface around it, or if you detect an odd color change between the pad and the rest of the ATM, it could be a fake. Avoid “shoulder-surfers” at walk-up ATMs by blocking their view of the number pad as you enter your PIN. Consider placing one hand over the pad to hide your input. This is also a good idea to prevent skimmer cameras from seeing your PIN. Minimize time spent at the ATM when conducting a transaction. Once you have completed your transaction, leave quickly. Do not stay and count your money if it gives others an opportunity to approach you and take it from you. If you suspect any questionable activity at ATMs, or detect any unlawful use of your ATM or debit card, always note the date, time and location, and report the problem to your financial institution and the ATM operator (when applicable) immediately. File a police report to document theft.